The Halal in Travel summit by Crescentrating is set to make an impact at MIHAS 2018 which is among the most prominent travel trade exhibitions for leaders in the Halal travel industry. This major event will be held from April 4th to April 7th 2018 at the Malaysia International Trade and Exhibition Centre (MTEC) in Kuala Lumpur. MIHAS 2018 is hosted by the Ministry of International Trade and Industry (MITI) and organised by Malaysia External Trade Development Corporation (MATRADE). Halal In Travel was first launched at ITB Asia 2016 in Singapore, and the event that was held in the 2017 was even more successful. As part of the World Halal Week program, MIHAS 2018 will provide a platform for industry professionals and leaders to showcase their Halal products and services from industries such as cosmetics, pharmaceuticals, finance, e-commerce, logistics and Halal travel. MIHAS 2018 will also provide excellent networking opportunities for professionals who are within the Halal travel and tourism industry. MIHAS 2018 will be held on an international scale, where leaders and professionals who are part of the Halal travel industry will come together from different parts of the globe. Malaysia was also at the top of the 2016 Global Muslim Travel Index and is among the best trading platforms, and these factors create an ideal setting for the Halal In Travel summit. The highlights of the past Halal in Travel events include excellent keynote speakers who share their knowledge and expertise on varying subjects related to the rapid development of the Halal travel industry. This year’s event will also feature prominent keynote speakers, interactive panel discussions as well as specialist presentations which will help participants gain significant insight into the Muslim Travel Market and the Halal industry. Additionally, Halal In Travel will also focus on the latest trends, patterns and developments in Halal travel and tourism sectors. The main focus of the Halal In Travel summit in 2017 was on the Muslim Millennial Market - and Muslim Millennial Travelers as well. The new trends that are constantly shaping up the Halal travel industry are results of the growing Muslim Millennial Market – which brought about the rise in demand for different travel products and services. The rise in Muslim Millennial Travelers continues to make an impact on the Halal travel and tourism industry, these developments can be observed in the Muslim Millennial Travel Report 2017 which was also released during the previous Halal in Travel. As Muslim Millennial Travelers crave more authentic and affordable travel experiences, there will be significant developments to observe. Research from the MasterCard-CrescentRating Global Muslim Travel Index 2016 has shown that the global Muslim Travel Market, was worth USD150 billion in 2015. The research also shows that the value will increase to USD220 billion by 2020. The discussions with experts from diverse backgrounds at Halal In Travel will help delegates gain valuable insight into how they can benefit from the rapid growth of the Muslim Travel Market. Additionally, industry professionals and stakeholders will also gain significant knowledge on how they can create a stronger presence in a billion-dollar industry. 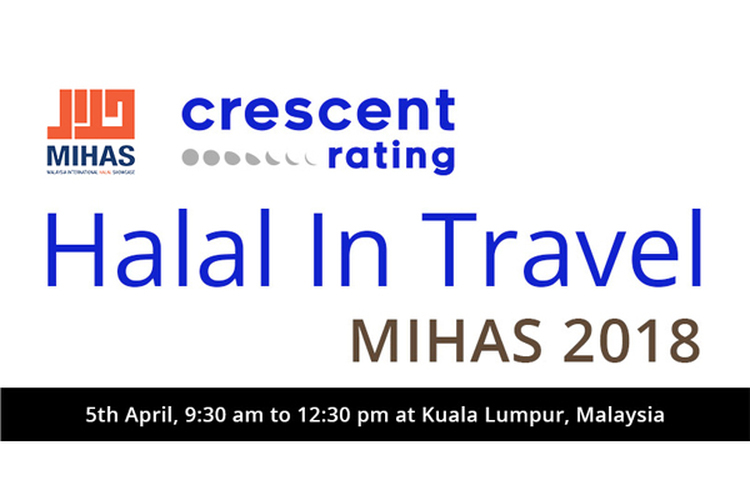 The Halal in Travel conference will be held at MIHAS and hosted by CrescentRating. This upcoming conference will a fusion of keynote speeches, interactive panel discussions, and specialist presentations that explore the latest trends and challenges to emerge in the Muslim travel market. Visit us at our booth 3606 & 3607 from 4-7 April on Level 3. If you wish to learn more about sponsorship and partnership opportunities or gain more information about Halal In Travel, please click here.